Add warmth to your hearth with a trio of cheerful red wreaths. 1. Fill the sink or a plastic tub with water. Place the florist's foam on the water; as the foam absorbs the water, it will sink. 2. Wedge the wet blocks into the plastic wreath form. 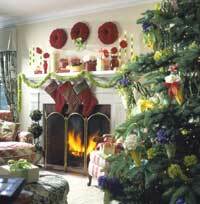 Stand the wreath on edge (as if hanging on the wall) to let excess water drain. 3. Cut the stems of the carnations to about 2 inches. 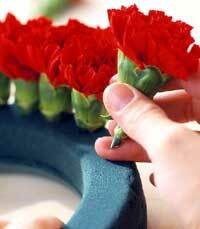 Starting on the face of the wreath, insert the flower heads into the foam, pushing in the stems all the way. If the flowers aren't fully open, leave about 1/8 to 1/4 inch of space between the flowers; if they are fully open, pack them together tightly. 4. 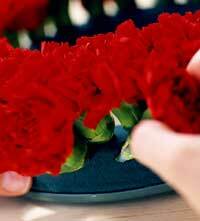 Repeat this procedure to insert carnations on the outside and inside edges of the wreath until the foam is completely covered. SAVE EVEN MORE! Say “Yes” to Ladies' Home Journal® Magazine today and get a second year for HALF PRICE - 2 full years (20 issues) for just $15. You also get our new Ladies' Home Journal® Family Favorites Cookbook ABSOLUTELY FREE! "I Can't Stand My Mother-in-Law"
"She Loves the Dog More Than Me"
© Copyright , Meredith Corporation. All Rights Reserved By using this site, you agree to our Terms of Service.